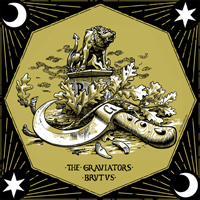 A 12' split featuring Norwegian / Swedish 70's hard rockers BRUTUS and the Swedish cornerstone of doom; THE GRAVIATORS. Limited edition, 500 copies, whereof 200 is coloured! This release will hit the stores in the middle of October, so stay tuned or be doomed. For fans of PENTAGRAM, REVEREND BIZARRE, ELECTRIC WIZARD and GRAVEYARD, GRAND FUNK RAILROAD & BLUE CHEER.